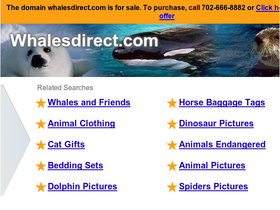 Visit Whales & Friends online at WhalesDirect.com for a variety of animal and nature theme clothing. Make a fashion statement with unique and exclusive apparel. You'll find t-shirts, sweatshirts, jackets, dresses, sweaters, socks and loungewear and caps decorated with cats, dogs, dolphins, horses, wolves and other amazing wonders of nature. Check back often at 58Coupons.com for the best WhalesDirect.com savings, WhalesDirect.com promotions and WhalesDirect.com coupons. Use this coupon code to get $5 off your order of $60 or more from WhalesDirect.com. Click link. Join Whales and Friends club and you'll get 10% discounts on all your orders plus a free gift. Follow this link for details. Check out Whales & Friends' new arrivals and you'll find great Tote Bags and T-Shirts for only $10. Click link for selection. Reap the benefits of joining Whales & Friends' Buyers Club today and get an instant 10% off your order. Click link to start. Check out Whales & Friends' Discount Outlet for great deals up to 80% off retail prices. Click link for selection.